Richard the First is known as “The Lionheart” due to his successes on the Battlefield. 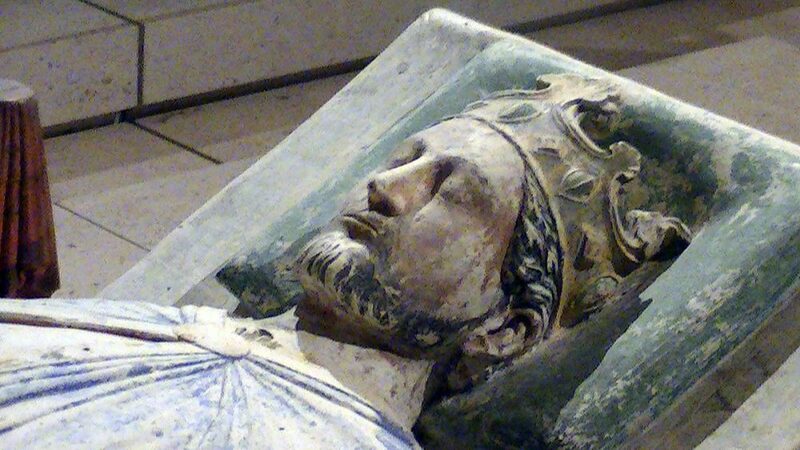 King from 1189 to his death in 1199, Richard I spent just 6 months of that reign in England. Most of his reign was spent on Crusade, or as the prisoner of the Holy Roman Emperor. The reign of Richard I is the story of the Crusade. This had huge implications for his realm. Taxation was needed to finance the Holy War. Richard I’s release from captivity was also expensive. To make matters worse, the Regent, the future King John, did little to aid matters. Richard was the third son of Henry II and Eleanor of Aquitaine (though the first born son died in infancy). He showed early promise as a politician and military commander. He is known to have commanded forces on his father’s behalf aged just 16. As second eldest surviving son it was expected that Richard would be granted lands upon his father’s retirement or death. He was trained for leadership with this in mind. As the lands of the Angevin Empire expanded, Richard’s ambitions grew. Perhaps influenced by the scheming of the French King and Dauphin, Richard grew frustrated at the lack of promotion he was given and the possibility of his younger brother being granted wealthy lands above him was an annoyance. Richard’s older brother, Henry the Young King, was frustrated by the lack of autonomy he was being given. He expected to be given control of some of the lands and finances the family held. In 1173 this frustration boiled over into revolt. Henry went to the French court and, joined by his brothers and the French, revolted against Henry. It was a large revolt. Barons on both sides of the English Channel rose alongside the sons. Henry II raised a large army though. While the rebellion gained momentum in some areas, he marched on the French. Compromises were offered by the king but rejected, possibly on the advice of the French. Henry II defeated the French, captured his wife and the wives of his sons and saw the revolt in England collapse. The French agreed a peace with Henry in summer 1174. It’s terms did not mention Richard, but did recognise his brothers. Richard realised that the campaign was lost, went to his father and begged forgiveness. The peace that was then concluded with him was half of what Henry had offered him earlier. This was not the end of Richard’s quarrels with his father though. The arguments over the control of land continued throughout Henry II’s reign. At times the families interests saw them act together, putting down rebellions in Aquitaine. However upon the death of Henry the Young King, the relationship worsened. Richard now stood to inherit England. Henry wanted to change inheritance for John so that he would now inherit Aquitaine. Richard however was already Duke of Aquitaine. He refused to concede the territory. His brothers gained the permission of their father to invade Richard’s lands. They did so and fighting continued on and off. Henry finally made Richard’s inheritance of England official in July 1189. It followed the defeat of Henry’s army by a force led by Richard and Philip of France. Henry died just two days after making this agreement. Richard and Philip had both taken the cross and agreed to participate in a crusade in 1187. Preparations were underway when Richard became king. Crusading is expensive. His new position as king allowed him to fund it more lavishly. Taxes, known as the Saladin tithe, had been collected. Lands were sold off. He allowed William of Scotland to buy himself out of an oath of subservience. The armies of Richard I and Philip II of France set off on Crusade in the Summer of 1190. The first port of call as Sicily, where Richard’s sister, Joan, had married the King. The King had recently died and Joan had been kept a virtual prisoner with no payment of her inheritance. Richard demanded that both her freedom and inheritance be given. Joan was freed but not inheritance was forthcoming. The negotiations continued and led to the townsfolk of Messina rioting in protest at the Crusaders remaining. As a result, Richard’s men stormed Messina and captured it. It forced the new King, Tancred, to agree terms with Richard. At the same time this increased tensions between Richard and Philip II. The Crusading Fleet set sail for Acre. However it was swept off course in a storm. Many ships found their way to Cyprus. The islands ruler, a man called Isaac, imprisoned the Crusaders who made the first landings. Richard heard of this as he arrived and demanded their release. Isaac’s refusal led to Richard ordering his men to capture the island. The Crusaders conquered Cyprus swiftly, having it under their control by 1st June 1190. Richard appointed governors and made arrangements for Cyprus to be sold. It was sold to the Knights Templar. Later, it was bought by Guy of Lusigan. Richard married Berengaria of Navarre in Cyprus and both were crowned as monarchs of the island. Richard and Philip II of France then made their way to Acre. Here they met with and allied themselves with other European leaders. The Crusaders set about besieging Acre. During the siege both Richard and Philip II became quite ill. Disease spread quickly in the camps. However, the surrender of Acre was eventually secured. Arguments broke out with the Austrian nobles. They were angered by Richard’s conquest of Cyprus as Isaac was one of their vassals. When the city was entered, Leopold of Austria had his banner placed alongside those of Richard and Philip II. They were enraged by this and threw it into the moat. The Austrians left the Crusade. Philip II soon became too ill to continue. He returned home. Richard now had no major allies with whom to fight the remainder of the Crusade. He did however have the prisoners that Philip held for the security of Acre. Richard gave the order to execute the prisoners. This was a highly unusual move in the Middle Ages but one that Richard felt necessary to enable his army to advance any further. The Crusaders then won the Battle of Arsuf before advancing to Jaffa. After the fall of Jaffa, the Crusaders approached Jerusalem. With the prized city in sight, Richard had a problem. So to did the army of Saladin. The occupying army of Saladin was low on morale and weak. It possibly could have been overwhelmed. However Richard was wary of his forces becoming too stretched and open to counter attack from any relief forces. The solution appeared to be to cut off the supply lines of Saladin, yet the Crusaders could not agree on this. Negotiations had to be entered. Richard was also concerned about possible plots in France and England. Ill with scurvy, he settled a peace with Saladin. From just miles away from Jerusalem he turned his army around and began the journey home. Richard’s fleet sailed for Corfu. Corfu was part of the Byzantine Empire that Cyprus had once been part of. He wasn’t welcomed. He set sail in disguise with a small group. The ship that carried them was hit by a storm and made ground, irreparable, on the Italian Coast of the Adriatic. The group now had to make it’s way on foot through Europe to lands that were sympathetic to Richard. The closest would be his brother-in-law, Henry the Lion. Unfortunately for Richard, this meant a route that went through the lands of Leopold of Austria. In December 1192 Richard was captured by the Duke’s men. Leopold was still incensed about Cyprus and the personal slight that Richard and Philip had made in Acre. Leopold took Richard to the Holy Roman Emperor, and was excommunicated for imprisoning a Crusader. The Holy Roman Emperor was in need of money. He was also aggrieved over a number of issues, including Richard refusing to pay homage. A ransom was set of 100000 pounds of Silver. The same amount that had been raised in tax to pay for the Crusade. Richard’s mother, Eleanor of Aquitaine, set about raising the money. It was a huge tax. In contrast, Prince John and King Philip II of France offered the Holy Roman Emperor silver to keep Richard imprisoned for a set period: ie to keep him away from them. Richard’s ransom was eventually raised and paid, buying his release. His later years saw ongoing conflict with Philip II of France. There was stop-start fighting over regions, Castle building in Normandy on a large and rapid scale. It was in one of these conflicts that Richard was hit by a Crossbow Bolt. The Bolt hit Richard in the shoulder. It was removed but an infection set in. Richard left his lands to John and his jewels to his nephew, Otto. He died from the infection on 6th April 1199. BBC – Biography of Richard I. Historic UK – Biography of Richard I.
Cyprus History – Cyprus under Richard I.
Avalon Project – One of Richard’s rules regarding Criminals during the Crusade. British Library – Images of Richard I.